Tips for Kitchen Updates on a Budget. Get the most bling for your buck. One of the are the cheapest and simplest ways to modernize the space is to replace those outdated brass or wooden handles with brushed silver or stainless steel pulls. New hardware can dramatically change the style of a cabinet instantly. Cabinet hardware is like jewellry and can dramatically dress up a kitchen! 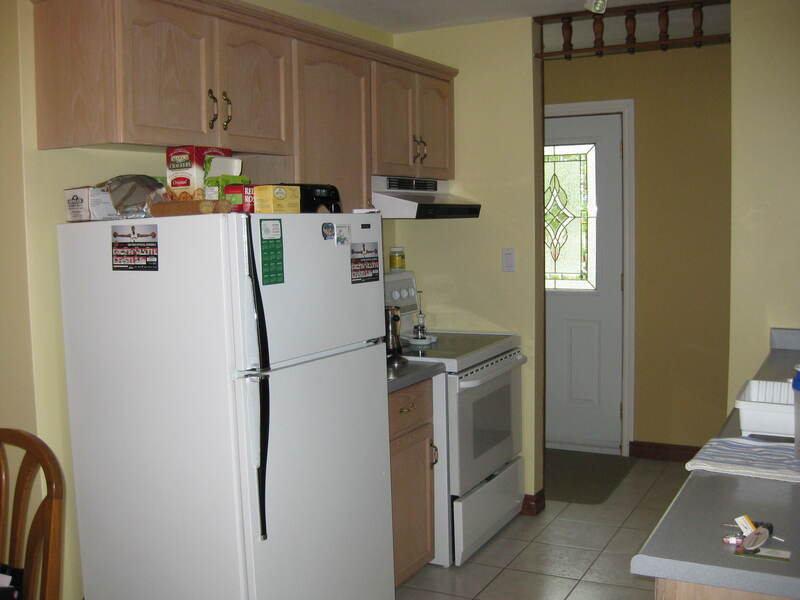 Since cabinets are vital to a kitchen, most home owners think they have to rip them out to update the space. That isn’t necessarily the case. If they are in good shape we recommend having them professionally painted or re-faced with laminate veneer. This step can save yourself thousands of dollars so you can splurge in other areas. If you have builder blah cabinets, adding trim to the perimeter of your cabinet doors creates trendy shaker doors which can then be accented with some fancy hardware. For a fresh look, why not cut out the middle panel and add glass centres? These are cost effective – and green – solutions as we trend towards re-using what we have in our homes and simply re-inventing them in new ways. 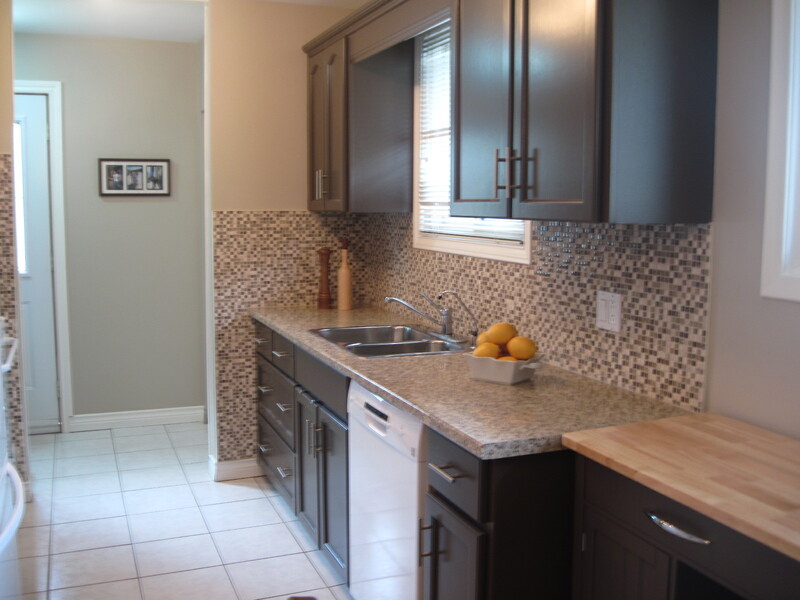 We transformed this kitchen with paint, new hardware and a great backsplash! Adding a backsplash plays a key role in adding visual interest in a kitchen. Not only are backsplashes incredibly functional, they are also the artwork in a kitchen. One of our favourite backsplashes is subway tiles because they are stylish and inexpensive. If you have a backsplash that is in good shape, consider having it re-glazed instead of replaced. Both are budget friendly solutions with high impact. Nice floors? Don’t hide them with scatter rugs at the sink. Rugs tend to stop the eye, segmenting a space. Instead, if you are keeping the flooring, consider having your tiles and grout professionally steam cleaned for a nice, fresh sheen. If you are replacing the floor, keep the flooring cohesive throughout the room as this will make it appear larger. From hardwoods to laminates to vinyl which looks like high end ceramics or hardwood, there are lots of choices with different price points. Countertops are another way you can add style in your kitchen. And this doesn’t mean adding expensive granite or quartz countertops to impress your family or potential buyers. Laminate countertops are all grown up now with many neutral shades and styles to choose from. They come in specialized finishes which look like other solid surface countertops. If you do choose to splurge in this area, why not simply install the higher priced countertop on the island to create a focal point in the space and keep laminate everywhere else? Changing the lighting in your kitchen is another way to easily and affordably update the room. Adding under mount cabinet lighting, updated pendants and pot lights adds function and instantly transforms the feel of your kitchen. When you invest in a renovation, don’t forget to update the lights as they pull all the elements together and highlight all your hard work. Lighting adds function and style to finish off this gorgeous kitchen! Color is another vital element when it comes to revitalizing any space and kitchens are no exception. If you are renovating to sell, stick with light neutrals and introduce color through art and table centerpieces. If you are staying in your home, we love light silvery blues and greens as they make kitchens feel both tranquil and cozy. Last – but definitely not least – be sure to maximize all of your functional, liveable space! If your kitchen is large enough to fit a table and chairs, make sure to take advantage of this great feature. If you have an island, add function and style with bar stools. Regardless of whether you are selling or staying, utilizing every square foot of your kitchen adds function, appeal and increases the overall value of your home. Heather Cook is Co-Owner of Rooms in Bloom Home Staging & Design Inc., an award winning home staging company based out of Kitchener, ON. Selected as the 2012 Canadian Home Staging Company of the Year as well as the 2011 Canadian Professional Stager of the Year by RESA, Heather and her partner Alana Merritt are pros at giving great tips and advice to their clients so that the properties they stage sell fast and for top dollar. Keep up to date with this dynamic duo on their Facebook Fan Page or view their extensive portfolio online to see projects they have worked on. 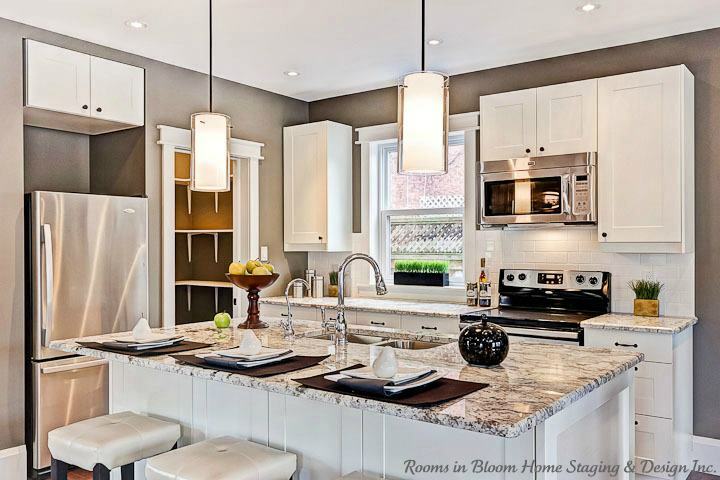 « The importance of a home staging contract & the design clause. Why include small photos? They are so hard to see. The first photo is perfect, large, clear and enticing. hi Jeanie. If you have too many large photos then the page loads very slowly. You should be able to click on the photos to view them larger.